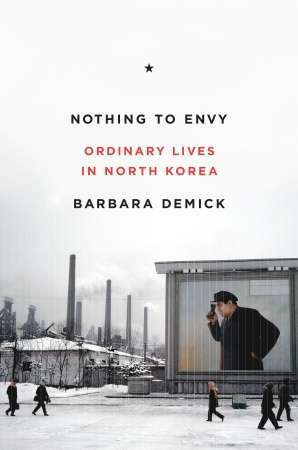 Over this past Thanksgiving, my sister introduced Sarah and me to a recent book about North Korea by Barbara Demick called “Nothing To Envy.” I won’t even attempt to write a review of the book because I don’t know how to evaluate nor critique Demick’s storytelling – the book moved me too much. So I’ll just write some of my reactions to the book as I finished it earlier today. If you want to know some of the stories, you can read the book for yourself. Night satellite photo of the Korean peninsula. 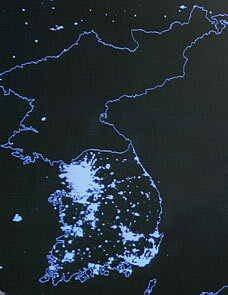 Notice that North Korea has no lights! Demick interviewed about 100 North Korean refugees over the span of her time working as a correspondent for the L.A. Times. Her book is a combination of journalistic report covering one of the most elusive regimes (and nations) in our world and story-telling that gripped me from the start. The story revolved around the lives of six characters all based in the northern region of North Korea. They all had something to do with the city of Chongjin. She weaves their tales together to paint a picture of the brutally oppressive government and the paranoia that caused famine and starvation to consume a generation. As I read this book, I was overwhelmed by a sadness and anger that even now pushes me to the brink of tears as I write this. I know that there are places of extreme suffering in the world. I know there are places where famine has killed millions, persecution has instilled fear into the hearts of people, and dictators have held onto power at all costs. What makes it hit so close to home is that I know that my own journey as a Korean-American is somehow tied into the fates and histories of the nameless and faceless men, women, boys, and girls who have died there. I think about the thousands of North Korean refugees who have been sold, trafficked, and otherwise mistreated across the border in China. I think about the myriad of abortions in North Korea because it’s better to kill a baby in the womb than to have a newborn die of starvation and malnutrition. I think about my own two sons who wouldn’t have a chance to survive. I think about all the food, all the blessings, all the opportunities I have had – opportunities that I assume are a given right for my children. I think of all these, and I weep and weep and weep. I weep for those who have no idea what lies beyond their borders. I weep for those who go hungry and cold, mistreated and oppressed. I weep for my own callousness as I continue on with my own life. I’m not saying that I’m more blessed by God because I have more stuff. We must be careful not to equate Western materialism with the hand of God. I weep because I occupy the same world with these North Koreans, and by my actions, I don’t care. But I do not weep without hope. I weep knowing that God’s heart breaks also for the hungry, the imprisoned, and the oppressed. I weep knowing that one day, just as He came the first time, so He will return again this time not as a baby, but as a conquering hero. I weep crying out for judgment – that God will restore all things, that He will make the wrongs right. The hungry will be fed. The captive will be free, and the poor will sit at the table. To be sure, that day will come, but until then, let me weep and feel God’s heart. Let me teach my boys that they have nothing to envy in this world. That no matter how much or little they might have, God is everything. Let me set our sights on that Day, living for that moment when we shall see him as He is. Let me live simply, intentionally, and missionally. I don’t want to just weep and think, I want to act and serve. I want to be a part of God’s design to usher in the kingdom that is fully coming, and will one day be fully realized. I want to see North Korea redeemed, not with the material goods of the Industrialized World, but the Gospel of Jesus Christ that says indeed because of Christ, we have nothing to envy.